Pastor Paul Dudka was studying in Theological Bible institute for four years and earned a bachelor degree of theological education. After graduation, He was invited to be a teacher of History in the same Theological institute and now he is involved in that ministry. Now, in Theological Bible institute which located in Chernivtsy city, are about 37 students from four different oblasts of Western Ukraine. Main purpose of Theological institute to prepare effective ministers, missioners and Bible teacher for Jesus work in our area and out of it. All teachers, including pastor Paul Dudka serving at institute for free, without receiving any money, but all of them deeply understand their calling from God to prepare students for God’s work. 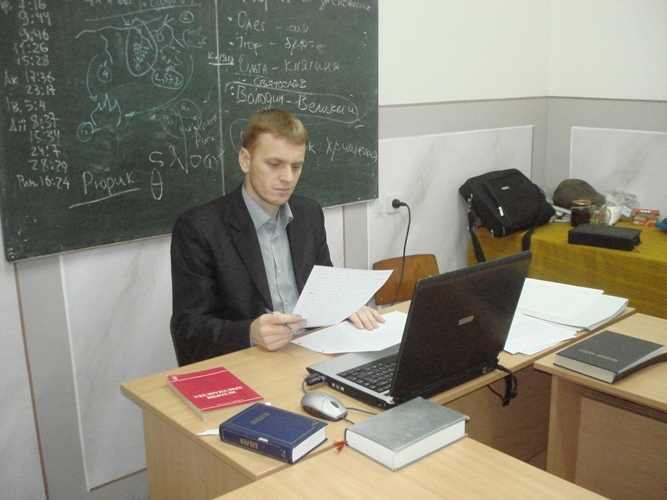 It is third year for pastor Paul Dudka to teach at the institute and at now he is teaching History of Christianity, but in future perhaps he will teach some more Bible courses because of lack of teachers. Of course pastor Paul Dudka needs your prayer and your supportion in his ministry and he will be grateful to hear about your prayers.